Simple application for controlling incoming ssh cconnections. Every connection will be prompted for user confirmation or notified to user. Pam remote host value may contain hostname or ip depends on your network/ssh/dns configuration, so it's allowed to write anything to whitelist config and user responsible to control this himself. This app works good on Sailfish 2.1.2.3. 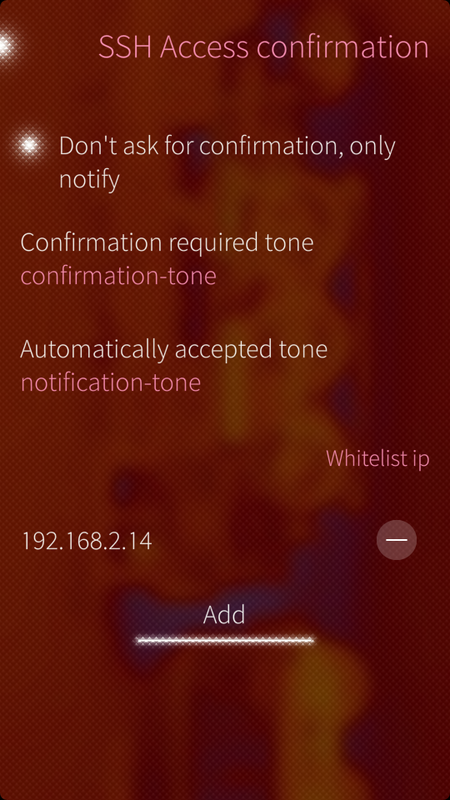 Is there a bug: If I Added a IP-Adress to the whitelist, i receive no more connection warning from my mobilephone. And If i Delete this ip again, it will also shown into the whitelist again at next time. Reinstalling takes no effekt. Pleas help me. With SailfishX (2.1.3.5 Kymijoki) on Xperia X, settings are not saved, except "Don't ask for confirmation, only notify". The white list does not survive after the setup page is closed. 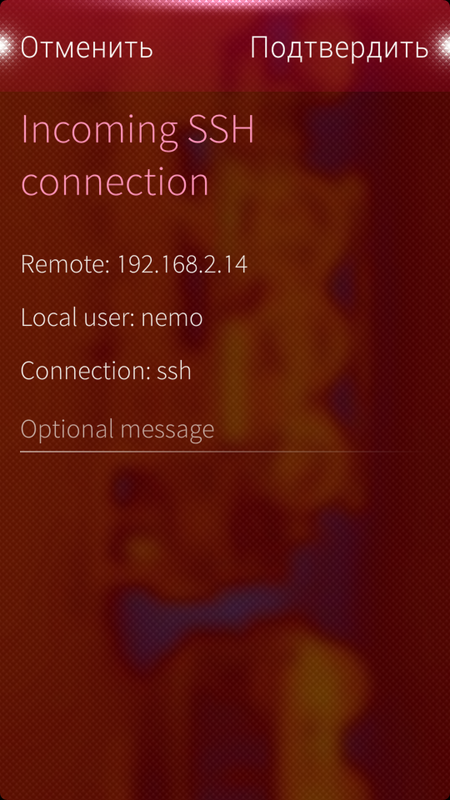 App stopped working after upgrade to SailfishOS 2.1.0.11. Got it working again by unistall - install. I did uninstall the openSSH from openrepos as well, but that may not have been necessary. I'm happy to have it working again, as I use it for a kind of 2-factor authentication. I store my (passkey secured) ssh keys on my Jolla and will scp them over (temporarily) for loading them into ssh-agent every boot of my laptop. With a locked phone, this requires the PIN to unlock it all. In the future I will block the phone itself from making the ssh on the server. Thus you need the 2 devices together + PIN to get the connection. Is there a known problem on 1.1.7? I've installed this tool first time nuw, but ssh login is possible without any notification. Also whitelist to some ip does not change anything. App used to work but stopped working for me. I suppose it is not supposed to work when using ssh over the usb cable? At least for me it doesn't work in that case. EDIT: Doesn't work with Wifi either. Any idea what I'm doing wrong? Am I supposed to do anything at all? EDIT2: By "does not work" I mean it does not do anything at all. No notification, no dialog. Only thing which came to my mind was some iptables rules I added, but I suppose they shouldn't stop this thingy? EDIT3: Yes, I double-checked the daemon is running... Is it working for everybody else? I didnt work for me as long as I head a newer ssh release from openrepos installed. Works fine with the original jolla release now! More options to get notified when a client wants to connect whatever it's whitelisted, needs confirmations or automatically accepted, like viberation or notifications like "your-whitelisted-ip has logged in"..
will think about other suggestions some day.